Th2 cells are important effector cells during allergic disorders and parasite infections. Efficient differentiation of Th2 cells requires signaling via the IL-4R and the transcription factor Stat6. Stat6 is further implicated in Th2 cell recruitment to the lung and might be required for the survival of memory Th2 cells. We analyzed the role of Stat6 in T cell expansion, survival, and recruitment to the lung using competitive adoptive transfer experiments and infection with the helminth parasite Nippostrongylus brasiliensis. Stat6 was not required in T cells or other cell types for recruitment of in vivo-generated Th2 cells to the lung. Functional analysis of Th2 memory cells revealed that Stat6 signaling in CD4 T cells was dispensable for memory cell generation, expansion, and cytokine secretion. However, Stat6-deficient T cells survived better than wild-type T cells, resulting in higher accumulation in the bronchoalveolar lavage, lung, and lymph nodes. This demonstrates that effector T cell expansion is negatively controlled by a novel Stat6-dependent mechanism which probably serves to limit the number of effector T cells during the acute phase of the immune response and thereby lowers the risk of bystander toxicity against healthy tissues. Type 2 immune responses such as those associated with allergic asthma or immunity to helminths are characterized by polarization of CD4 T cells to the Th2 phenotype and accumulation of these cells and other effector cells such as eosinophils and basophils at the site of inflammation. The generation of IL-4 reporter mice (1) and mice with defects in components of the IL-4R signaling pathway (2, 3, 4) have given important insights into the role of IL-4 in this process. The transcription factor Stat6 plays a central role in mediating IL-4 and IL-13 signaling. Upon binding of IL-4 or IL-13 to their receptors, Stat6 is recruited to the IL-4Rα subunit and is phosphorylated by the tyrosine kinases Jak1 and Jak3, resulting in homodimer formation and subsequent translocation to the nucleus, where it regulates the expression of numerous genes involved in type 2 immune responses (5). Stat6 can be considered a master regulator of type 2 immunity due to its function in a variety of cell types. After IL-4 binding, Stat6 signaling in T cells is required for stabilization of the Th2 phenotype (6) and for expression of the chemokine receptors CCR4 and CCR8 implicated in Th2 cell recruitment (7). Stat6 controls Ig class switching to IgG1 and IgE in B cells (2, 3), the expression of the chemokines CCL11, CCL17, CCL22, and CCL24 for the recruitment of eosinophils and Th2 cells (8, 9), mucus production from goblet cells and induction of airway hyperreactivity (10), the differentiation of alternatively activated macrophages (11), and expulsion of gastrointestinal helminth parasites (12). An efficient immune response requires coordinated recruitment of effector cells to sites of inflammation. It has been demonstrated that in vitro-generated Th2 cells fail to be recruited to the lung after adoptive transfer into Stat6-deficient mice during allergic pulmonary inflammation (13). However, it is unknown whether recruitment of in vivo-generated Th2 cells to the lung is dependent on Stat6 or not. Although Stat6 is required to stabilize the Th2 phenotype, it has been demonstrated that it is not required for the initial differentiation of IL-4-producing T cells (14). Interestingly, strong primary type 2 immune responses are able to elicit comparable IL-4 serum concentrations in wild-type (WT) and Stat6-deficient mice, whereas secondary responses to the same pathogen were Stat6 dependent, indicating that Stat6 might be required for the differentiation and/or survival of memory T cells (15). In this study, we wanted to examine the role of Stat6 in CD4 T cell expansion, recruitment, and survival during primary and recall responses using a physiological in vivo setting. Infection of mice with the helminth parasite Nippostrongylus brasiliensis causes massive Th2-associated inflammation in the lung and small intestine. This infection model induces similar pathophysiologic alterations in the lung as it is commonly seen in patients suffering from allergic asthma. This parasite can also be used as a potent natural adjuvant to induce Th2 polarization to model Ags (16, 17). We made use of this system in combination with TCR-transgenic and normal mice which express enhanced GFP (eGFP)3under control of regulatory elements of IL-4 (4get mice (1)) on a WT or Stat6-deficient background to define the role of Stat6 in Th2 cell expansion, recruitment, and survival in vivo. IL-4 reporter mice (4get mice) have been previously described (1). These mice carry an IRES-eGFP construct inserted after the stop codon of the IL-4 gene. Stat6−/− (6), DO11.10 TCR-tg mice (18), and BALB/c mice were originally obtained from The Jackson Laboratory. Stat6−/− mice were crossed to 4get mice to generate 4get/Stat6−/− mice. DO11.10 mice were crossed to 4get/Thy1.1 and to 4get/Stat6−/−/Thy1.2 mice. Rag2−/− mice on BALB/c background were purchased from Taconic Farms. All mice were backcrossed at least nine generations to the BALB/c background, housed according to institutional guidelines, and used between 6 and 12 wk of age. Third-stage larvae (L3) of N. brasiliensis were recovered from the cultured feces of infected rats, washed extensively in sterile 0.9% saline (37°C), and injected (500 larvae) into mice s.c. at the base of the tail. Mice were provided with antibiotics (2 g/L neomycin sulfate and 100 mg/L polymyxin B sulfate; Sigma-Aldrich) in the drinking water for the first 5 days after infection. CD4 T cells were isolated from spleen and mesenteric lymph nodes of 4get or 4get/Stat6−/− mice using a CD4 T cell isolation kit (Miltenyi Biotec). In brief, 107 purified CD4 T cells were transferred by i.v. injection into naive Rag2−/− recipient mice, which were infected 4 days later with N. brasiliensis and analyzed on day 9 after infection. To study OVA-specific immune responses, DO11.10 cells were transferred to 4get, BALB/c, or 4get/Stat6−/− recipients followed by priming and challenge with chicken OVA (Sigma-Aldrich). Briefly, single-cell suspensions were prepared from the spleen and peripheral lymph nodes of age-matched DO11.10/4get/Thy1.1 and DO11.10/4get/Stat6−/−/Thy1.2 mice. The frequency of CD4+ DO11.10 TCR-tg cells from each donor was determined by flow cytometry and 1–2 × 106 TCR-tg cells from normal and Stat6-deficient donors were transferred together into the same recipient mouse by i.v. injection. For in vivo proliferation studies, cells were labeled before transfer with 0.5 μM CFSE (Invitrogen Life Technologies) at 37°C for 10 min. One day after cell transfer, recipients were primed by s.c. injection of 500 N. brasiliensis L3 larvae mixed with 100 μg of OVA. Three or 6 days after priming, mice received an intranasal challenge with 500 μg of OVA in 50 μl of PBS. The PBL, bronchoalveolar lavage (BAL), lungs, and draining lymph nodes were analyzed 3 days later. To look at memory responses, spleen and lymph node cells were isolated 70 days after OVA priming and challenge. CD4 T cells were enriched by magnetic cell sorting (Miltenyi Biotec) according to the manufacturer’s instructions, and recipient mice received 25,000 CD4+ DO11.10 TCR-tg cells i.v., followed by priming and challenge with N. brasiliensis and OVA as described for the primary transfers. BALB/c or 4get/Stat6−/− mice were depleted of T cells by i.p. injection of 2 mg of anti-Thy1.2 Ab (30H12).Two days later, the mice received 75 × 106 4get/Thy1.1 spleen and lymph node cells i.v. Four days after cell transfer, the mice were infected with N. brasiliensis and analyzed 9 days later by flow cytometry. Bone marrow cells were prepared from the tibia and femur of 4get/Thy1.1 and 4get/Stat6−/−/Thy1.2 mice, mixed at equal ratios, and washed in PBS. Recipient 4get mice were lethally irradiated with 2 doses of 550 rad given 5 h apart followed by reconstitution with 5 million mixed bone marrow cells i.v. Mice were treated with antibiotics in the drinking water (2 g/L neomycin sulfate and 100 mg/l polymyxin B sulfate). Ten weeks later, mice were infected with N. brasiliensis and the ratio of 4get/Thy1.1:4get/Stat6−/−/Thy1.2 CD4+ T cells in lung, lymph node, and blood was determined on day 9 after infection by flow cytometry. Single-cell suspensions were generated from lymph nodes or PBS-perfused lung samples that had been cut into small pieces and mechanically dispersed using a 70-μm nylon strainer (BD Falcon). Samples were washed once in FACS buffer (PBS/2% FBS/1 mg/ml sodium azide), incubated with anti-CD16/CD32 blocking Ab (2.4G2) for 5 min at 25°C, and stained with diluted Ab mixtures. The following mAbs were used: PE-conjugated anti-CD4 (clone RM4-5), PE-conjugated anti-CD44 (IM7.8.1), PE-A700-conjugated anti-CD4 (RM4-5), biotinylated anti-CD62L (MEL-14), allophycocyanin-conjugated anti-CD90.2 (5a-8), and anti-DO11.10 TCR (KJ1-26) were all purchased from Caltag Laboratories and Invitrogen Life Technologies. PE-conjugated anti-CD90.1 (HIS51) and biotinylated anti-CD11a (M17/4) were purchased from eBioscience. Annexin V-PE was purchased from ImmunoTools. Streptavidin-allophycocyanin (Southern Biotechnology Associates) was used to visualize biotinylated Abs. Samples were acquired on a FACSCalibur instrument (BD Immunocytometry Systems) and analyzed by FlowJo software (Tree Star). For FACS, cells were sorted using a high-speed cell sorter (FACSAria; BD Immunocytometry Systems) with ≥98% purity. In brief, 106 total cells from tracheal lymph nodes of N. brasiliensis-infected 4get or 4get/Stat6−/− mice were restimulated for 3 h in 100 μl of complete medium with 1 μg/ml ionomycin and 40 ng/ml PMA. Then cytokine secretion was analyzed with the IL-4 cytokine capture assay according to the instructions of the manufacturer (Miltenyi Biotec). In brief, IL-4 released from the cell is captured on the cell surface and can be detected with a PE-labeled anti-IL-4 mAb. Single-cell suspensions of spleen and lymph nodes of DO11.10/4get/Thy1.1 and DO11.10/4get/Stat6−/−/Thy1.2 mice were cultured at 5 × 105 CD4+KJ1-26+ cells/ml with 250 μg/ml OVA and 20 ng/ml recombinant human IL-2 (ImmunoTools) in RPMI 1640 medium (PAN Biotech) supplemented with penicillin-streptomycin, l-glutamine (Biochrom), and 10% FBS. For Th2 cultures, 20 ng/ml or 100 ng/ml recombinant mouse IL-4 (R&D Systems) and 20 μg/ml anti-IFN-γ (XMG1.2) were added. For Th1 cultures, 5 ng/ml IL-12 (ImmunoTools) and 20 μg/ml anti-IL-4 (11B11) were added. During culture, the number of viable cells was counted using trypan blue exclusion and the percentage of TCR-tg cells (KJ1-26+ cells) was determined by flow cytometry. For measurements of the sub-G1, DNA peak cells were fixed in −20°C 70% ethanol for 4 h, washed twice in PBS, and incubated with 10 μg/ml propidium iodide and 50 μg/ml RNase A 30 min before flow cytometric analysis. To visualize the generation and accumulation of IL-4-expressing T cells in WT and Stat6-deficient mice, these mice were crossed to sensitive IL-4 reporter mice (4get mice, (1)) and infected with the helminth parasite N. brasiliensis. eGFP+ T cells in 4get mice represent Th2 cells since they all release IL-4 protein after brief in vitro restimulation (19). The frequency of IL-4/eGFP+ cells among total CD4 T cells in the lung increased to >30% in normal 4get mice but only to 15% in 4get/Stat6−/− mice on day 8 after infection (Fig. 1⇓A). These results are consistent with the initial characterization of 4get mice (1) and reflect the requirement for Stat6 to stabilize the Th2 differentiation (14). Surprisingly, absolute cell counts revealed that there were more total CD4 T cells in the lung of Stat6-deficient compared with WT mice, resulting in equal total numbers of Th2 cells in the lung of both strains (Fig. 1⇓A). In naive mice, the total number of CD4 T cells was comparable between WT and Stat6-deficient mice (Fig. 1⇓B). This result indicated that accumulation of effector CD4 T cells in the lung might be restricted by IL-4/Stat6-mediated signals. To compare the activation status of WT and Stat6-deficient CD4 T cells in the lung, the expression of activation markers was analyzed. The total frequency of effector CD4 T cells (CD11ahigh or CD44highCD62Llow) in 4get and 4get/Stat6−/− mice was comparable at days 5 and 10 after infection (Fig. 1⇓, B and C). Furthermore, all IL-4/eGFP+ cells in 4get and 4get/Stat6−/− mice showed an activated phenotype (CD11ahighCD44high). However, even in the strong Th2- polarizing conditions, the majority of effector CD4 T cells in 4get/Stat6−/− mice did not express IL-4/eGFP, which indicates that the cells were activated but failed to fully differentiate to Th2 cells. Expansion, differentiation and activation status of Th2 cells in 4get and 4get/Stat6−/− mice during N. brasiliensis infection. A, 4get (▪) and 4get/Stat6−/− (□) mice were infected with N. brasiliensis, and the frequency of Th2 cells (IL-4/eGFP+ cells) among total CD4 T cells (left), the total number of CD4 T cells (middle), and the total number of Th2 cells (right) were determined in the lung at day 8 after infection by flow cytometry. Bars show the mean ± SEM of five to eight mice per group from three independent experiments. The p values were calculated by Student’s t test. B, Total number of CD4 T cells in lung, spleen, paratracheal lymph node (ptLN), and mesenteric lymph node (mLN) of naive 4get (▪) or 4get/Stat6−/− mice (□). Error bars indicate SD (n = 3). C, The expression of CD11a and IL-4/eGFP on CD4 T cells isolated from the lung of 4get and 4get/Stat6−/− mice was determined at the indicated time points. D, The expression of CD44 and CD62L on gated IL-4/eGFP+ and IL-4/eGFP− CD4 T cells isolated on day 10 after infection from the lung of 4get and 4get/Stat6−/− mice was determined by flow cytometry. E, IL-4 protein secretion and IL-4/eGFP expression from CD4 T cells isolated from paratracheal lymph nodes of 4get and 4get/Stat6−/− mice was determined on days 5 and 10 after infection as described in Materials and Methods. We have demonstrated before that the intensity of the IL-4/eGFP signal in CD4 T cells of 4get mice directly correlates with the amount of IL-4 protein released from the cell after restimulation (19). However, it is unknown whether secretion of IL-4 protein is regulated by Stat6. We therefore determined the efficiency of IL-4 protein release by analysis of IL-4/eGFP expression and IL-4 protein secretion from T cells of 4get and 4get/Stat6−/− mice on days 5 and 10 after N. brasiliensis infection (Fig. 1⇑D). The vast majority of IL-4/eGFP+ cells in both 4get and 4get/Stat6−/− mice secreted IL-4 protein after brief in vitro restimulation. Therefore, IL-4/eGFP+ T cells in 4get/Stat6−/− mice show no defect in IL-4 protein secretion and could serve as IL-4-producing effector T cells. 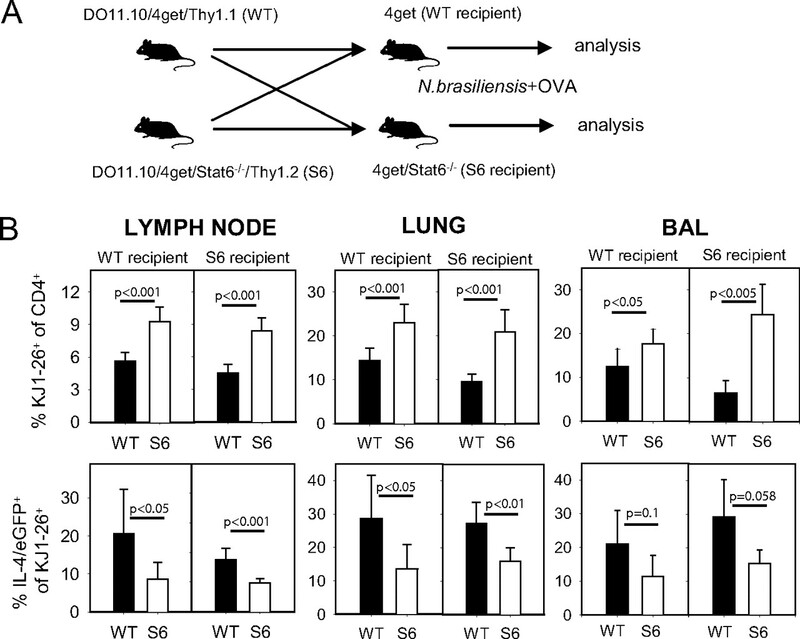 To address whether the increased number of CD4 T cells in the lung of Stat6-deficient mice after N. brasiliensis infection was due to a T cell intrinsic effect or regulated by Stat6 expression in other cell types, Rag2-deficient mice were reconstituted with 107 CD4 T cells from 4get or 4get/Stat6−/− mice, infected with N. brasiliensis, and analyzed 9 days later. As shown in Fig. 2⇓A, the percentage of CD4 T cells in Rag2-deficient mice reconstituted with 4get/Stat6-deficient CD4 T cells was twice as high compared with mice reconstituted with CD4 T cells from 4get mice, while the frequency of IL-4/eGFP+ T cells among total CD4 T cells was four times higher in mice reconstituted with 4get CD4 T cells than in mice reconstituted with 4get/Stat6−/− CD4 T cells. This result suggests that the lack of Stat6 in T cells accounts for an increased accumulation of CD4 T cells in Stat6-deficient mice (Fig. 1⇑A). To further substantiate this finding and to exclude that this effect can only be observed in mice where all T cells lack Stat6, mixed bone marrow chimeras were made by reconstitution of lethally irradiated 4get/Thy1.1 mice with a mixture of bone marrow cells from 4get/Thy1.1 mice and 4get/Stat6−/−/Thy1.2 mice. Mice were infected with N. brasiliensis 8 wk after reconstitution and were subsequently analyzed for the ratio of cells derived from WT (Thy1.2−) or Stat6-deficient (Thy1.2+) T cells in blood, paratracheal lymph nodes, and lung. Dot plots of a representative experiment are shown in Fig. 2⇓B. In blood and lymph nodes, the frequency of Stat6-deficient cells among total CD4 T cells was 33% but this frequency increased to 43% in the lung (Fig. 2⇓B). 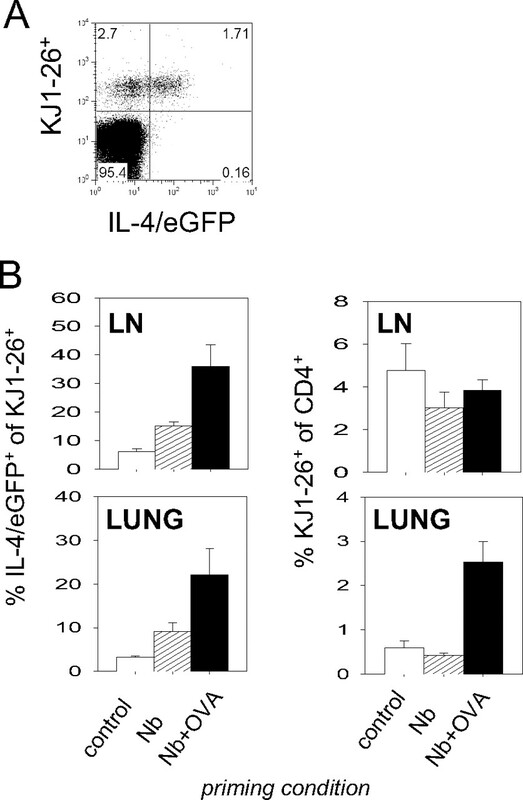 An analysis of the IL-4/eGFP+ cells within the CD4 T cell population also revealed a bias toward IL-4/eGFP+ Stat6-deficient cells in the lung (26% 4get/Stat6−/−- derived IL-4/eGFP-expressing cells in the lung vs 21% in blood and lymph nodes, Fig. 2⇓B). The relatively low frequency of Stat6-deficient T cells among total T cells most likely reflects an incomplete deletion of endogenous T cells after irradiation or an unequal ratio of bone marrow cells used for reconstitution. Nevertheless, analysis of four individual mixed chimeras showed that the preferential accumulation of Stat6-deficient T cells in the lung was statistically significant (Fig. 2⇓C). This clearly shows that under these competitive settings in the same environment recruitment of WT Th2 cells was less efficient. Stat6 expression in T cells limits effector CD4 T cell accumulation. A, In brief, 107 purified CD4 T cells from 4get or 4get/Stat6−/− mice were adoptively transferred into Rag2−/− mice followed by infection with N. brasiliensis. The frequency of CD4 T cells among total live cells and Th2 cells (IL-4/eGFP+ cells) among CD4 T cells was determined by flow cytometry on day 9 after infection in the lung. Dots indicate individual mice. The p values were calculated by Student’s t test. B, Mixed bone marrow chimeras were generated by transfer of bone marrow cells from 4get/Thy1.1 and 4get/Stat6−/−/Thy1.2 mice into lethally irradiated 4get/Thy1.1 mice. Chimeras were infected with N. brasiliensis 8 wk after reconstitution and analyzed 9 days later by staining of single-cell suspensions from blood, paratracheal lymph node, and lung for CD4 and Thy1.2. Percentages in the upper right quadrant show the frequency of Stat6-deficient IL-4/eGFP+ cells among total IL-4/eGFP+ cells. Dot plots are gated on CD4+ cells. C, Frequency of Stat6-deficient CD4 T cells among total CD4 T cells in lung, paratracheal lymph node, and blood of four individual mixed bone marrow chimeras described in B. The increased frequency of Stat6-deficient cells in the lung compared with lymph node (LN) and blood is statistically significant (unpaired Student’s t test). 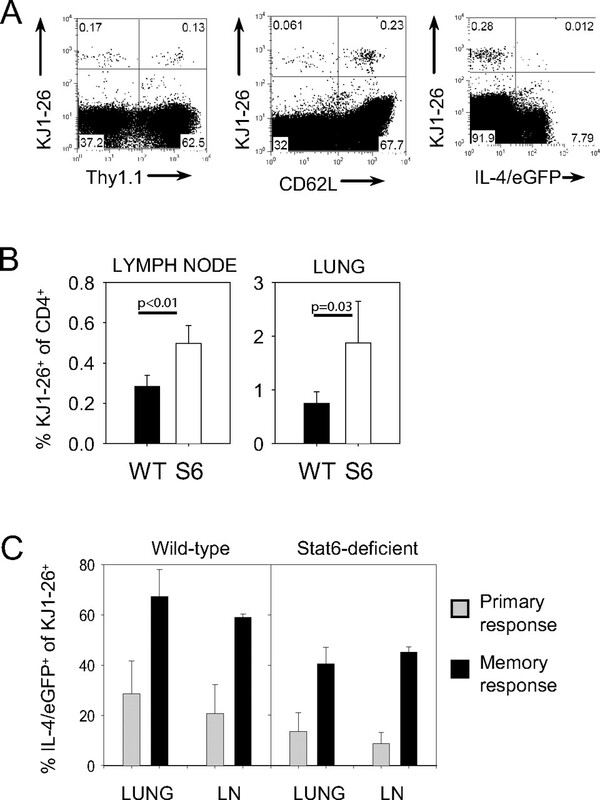 The previous experiments show that the expression of Stat6 in T cells limits accumulation of effector T cells in the lung during a type 2 immune response. To analyze whether recruitment of Th2 cells to the lung was dependent on Stat6 expression in non-T cells, we depleted endogenous T cells in 4get/Stat6−/− mice or BALB/c mice with anti-Thy1.2 mAb and reconstituted these mice with T cells from 4get/Thy1.1 donors. Four days after reconstitution, mice were infected with N. brasiliensis and analyzed 9 days later. Transferred WT CD4 T cells (Thy1.1+) constituted a large fraction of total CD4 T cells in lung and draining lymph nodes of both BALB/c and 4get/Stat6−/− recipients. Importantly, we found no difference in the frequency of donor-derived Th2 cells (IL-4/eGFP+) in lung or lymph nodes of reconstituted BALB/c or 4get/Stat6-deficient mice (Fig. 3⇓). Therefore, efficient recruitment of in vivo-generated Th2 cells to the lung can operate independently of Stat6-regulated genes in non-T cells. Th2 cell recruitment to the lung occurs independently of Stat6 in non-T cells. Endogenous T cells of BALB/c or 4get/Stat6−/− mice were partially depleted with anti-Thy1.2 mAb and replaced with T cells from 4get/Thy1.1 mice as described in Materials and Methods. The reconstituted mice were then infected with N. brasiliensis and analyzed 9 days later. The dot plots show the frequency of remaining endogenous CD4 T cells (CD4+Thy1.1−) and transferred CD4 T cells (CD4+Thy1.1+) in lung and paratracheal lymph node of indicated recipient mice. Histograms show the frequency of Th2 cells (IL-4/eGFP+ cells) among donor-derived CD4 T cells (CD4+Thy1.1+). The results are representative of six mice from two independent experiments. In the experiments described above, we analyzed endogenous polyclonal CD4 T cell populations during infection with N. brasiliensis. Although this is a powerful system to study type 2 immune responses in vivo, we cannot exclude that the TCR repertoire might be different between WT and Stat6-deficient mice which could make interpretations of the results difficult. Therefore, we decided to use a TCR-transgenic adoptive transfer approach to analyze the role of Stat6 in T cells and non-T cells in more detail. OVA-specific DO11.10 TCR-tg cells were transferred into naive recipient mice, which were then infected with a mixture of N. brasiliensis larvae and OVA to induce Th2 cell differentiation. Mice were challenged intranasally with OVA on day 6 after infection and analyzed 3 days later by flow cytometry. This protocol leads to expansion of the TCR-tg T cell population and ∼40% of these cells differentiated to IL-4/eGFP-expressing Th2 cells in the paratracheal lymph nodes (Fig. 4⇓A). Efficient recruitment to the lung and Th2 polarization in lung and lymph nodes was only observed when mice were primed with a mixture of N. brasiliensis and OVA, not with N. brasiliensis alone, excluding an Ag-independent effect on T cell expansion and polarization by this parasite (Fig. 4⇓B). TCR-tg system to follow Ag-specific Th2 cell responses in vivo. In brief, 1.5 × 106 OVA-specific KJ1-26 TCR-tg cells from DO11.10/4get mice were transferred into BALB/c recipient mice, which were either left untreated or were infected with N. brasiliensis alone (Nb) or with a mixture of N. brasiliensis and 100 μg of OVA (Nb + OVA). Six days later, mice were challenged by intranasal application of 500 μg of OVA and analyzed by flow cytometry 3 days thereafter. A, The dot plot shows the expression of IL-4/eGFP in OVA-specific KJ1-26+ TCR-tg cells isolated from the paratracheal lymph node. B, The graphs show the percentage of TCR-tg cells (KJ1-26+) among CD4 T cells and the percentage of Th2 cells (IL-4/eGFP+) among TCR-tg cells in lung and paratracheal lymph nodes (LN). Bars indicate the mean ± SEM from combined results of two independent experiments with a total of four mice per group. By using congenic differences of the Thy1 surface marker, we performed competitive adoptive transfers with T cells from DO11.10/4get/Thy1.1 and DO11.10/4get/Stat6−/−/Thy1.2 mice and analyzed expansion and Th2 cell differentiation of these cells in the same recipient mice, which were either 4get or 4get/Stat6−/− mice (Fig. 5⇓A). This adoptive transfer system revealed a bias toward accumulation of Stat6-deficient TCR-tg cells in lymph nodes, lung, and BAL in recipient mice (Fig. 5⇓B, upper panel). Furthermore, Stat6 expression in recipient mice was not required for recruitment of TCR-tg Th2 cells to lung or BAL, confirming our previous results obtained with polyclonal T cell transfers (Fig. 3⇑). As expected, the frequency of IL-4/eGFP-expressing cells among transferred DO11.10/4get T cells was about 2-fold higher than for DO11.10/4get/Stat6−/− T cells (Fig. 5⇓B, lower panel). Despite the lower frequency of IL-4/eGFP-expressing cells from Stat6-deficient donors, their increased frequencies in lymph nodes, lung, and BAL resulted in similar total numbers of IL-4/eGFP+ TCR-tg cells from both donors and confirms our initial observations obtained by comparison of polyclonal Th2 cell numbers of N. brasiliensis-infected 4get and 4get/Stat6−/− mice (Fig. 1⇑A). Similar results were obtained when mice were primed with OVA/alum i.p. and intranasal OVA challenge, excluding the possibility that this phenomenon is limited to helminth infections (data not shown). Stat6 limits expansion of Ag-specific CD4 T cells in vivo but is not required for effector cell recruitment to the lung. A, Experimental setup. Equal numbers of TCR-tg cells from DO11.10/4get/Thy1.1 (WT) and DO11.10/4get/Stat6−/−/Thy1.2 (S6) mice were transferred into 4get (WT recipient) or 4get/Stat6−/− (S6 recipient) mice followed by priming with N. brasiliensis plus OVA and intranasal OVA challenge 3 days later. B, Three days after challenge, paratracheal lymph nodes, lung, and BAL of the indicated organs were analyzed for the frequency of TCR-tg cells (KJ1-26+) from WT or S6 donors (upper panel) and for the frequency of Th2 cells (IL-4/eGFP+) among TCR-tg cells (lower panel). Bars indicate the mean ± SEM from combined results of two independent experiments with a total of six mice per group. The p values were calculated using Student’s t test. The increase of Stat6-deficient T cells could be due to faster proliferation or better survival of these cells compared with WT T cells. To distinguish between these two possibilities, lymphocytes from DO11.10/4get/Thy1.1 and DO11.10/4get/Stat6−/−/Thy1.2 mice were labeled with CFSE and cotransferred at equal ratios of TCR-tg cells into naive recipient mice which were then primed with N. brasiliensis plus OVA. An analysis of the draining lymph nodes showed that almost twice as many TCR-tg cells were derived from Stat6-deficient donor cells (Fig. 6⇓A), and the CFSE dilution profile of these cells shows that they had not undergone more cell divisions but rather survived better than their WT counterparts. Accumulation of Stat6-deficient CD4 T cells is due to better survival and not due to enhanced proliferation. A, Equal numbers of TCR-tg CD4 T cells from DO11.10/4get/Thy1.1 and DO11.10/4get/Stat6−/−/Thy1.2 mice were labeled with CFSE and transferred into 4get recipient mice followed by infection with N. brasiliensis plus OVA. The dot plot shows the frequency of TCR-tg cells derived from WT (KJ1-26+Thy1.1+) or Stat6-deficient (KJ1-26+Thy1.1−) donors on day 3 after infection. The histogram shows an overlay of the CFSE dilution profile from WT (filled histogram) and Stat6-deficient (open histogram) TCR-tg cells. Results are representative of four individual mice. B, In vitro cocultures of WT (•) and Stat6-deficient (○) TCR-tg cells were set up as described in Materials and Methods. Graphs indicate the relative change in the number of TCR-tg cells from each donor population during the course of the experiment and represent the mean of two values per time point. The results shown are representative of seven individual experiments. C, Cocultures of WT (•) and Stat6-deficient (○) TCR-tg cells were set up under Th2-polarizing conditions and the frequency of IL-4/eGFP-expressing cells was analyzed at the indicated time points by flow cytometry. D, Th2-polarized cocultures were stained on day 5 for KJ1-26, Thy1.1, and annexin V to detect apoptotic cells among WT and Stat6-deficient T cells. Dot plots are gated either on KJ1-26+Thy1.1+ cells (WT) or KJ1-26+Thy1.1− cells (Stat6 deficient). The experiment has been repeated with similar results. E and F, Separate Th2-polarizing cultures were set up with either WT (▪) or Stat6-deficient (□) TCR-tg cells. E, The frequency of cells with fragmented DNA was determined by staining of chromosomal DNA with propidium iodide and analysis of the sub-G1 content as described in Materials and Methods. F, The total number of dead cells in these cultures was determined by counting trypan blue+ cells at the indicated time points. To determine whether Stat6-deficient T cells have a general survival advantage over WT T cells or whether this difference can only be observed during a Th2-polarizing immune response, equal numbers of TCR-tg cells from DO11.10/4get/Thy1.1 and DO11.10/4get/Stat6−/−/Thy1.2 mice were cocultured in vitro in the presence of OVA Ag under neutral, Th1-, or Th2-polarizing conditions. The number of TCR-tg cells derived from WT or Stat6-deficient donors was calculated on the indicated days after start of culture by counting total live cells and determining the frequency of WT and Stat6-deficient TCR-tg cells by flow cytometry. Stat6-deficient T cells showed no growth advantage under neutral or Th1-polarizing conditions. However, Stat6 diminished expansion of WT T cells under Th2 conditions using low (20 ng/ml) or high (100 ng/ml) concentrations of IL-4 (Fig. 6⇑B). The frequency of IL-4/eGFP-expressing cells among WT T cells increased to >60% after 6 days of culture in Th2-polarizing conditions, whereas it remained below 5% in Stat6-deficient T cells (Fig. 6⇑C). This demonstrates that the function of Stat6 is required for Th2 polarization but at the same time IL-4 signaling mediated through Stat6 controls cell survival. We next tried to identify the mechanism(s) by which Stat6 restricts expansion of effector T cells. Annexin V staining on day 5 of Th2-polarized cocultures revealed that WT T cells contained about three times more apoptotic cells as compared with Stat6-deficient T cells (Fig. 6⇑D). Interestingly, apoptotic cells were only detected in the IL-4/eGFP− population, indicating that perhaps mainly uncommitted CD4 T cells are sensitive to IL-4-induced apoptosis. Furthermore, the frequency of T cells with a sub-G1 DNA content, which indicates degradation of chromosomal DNA in apoptotic cells, was higher in WT compared with Stat6-deficient T cell cultures (Fig. 6⇑E). In addition, the number of dead cells (trypan blue+ cells) in T cell cultures of WT T cells was higher compared with cultures of Stat6-deficient T cells (Fig. 6⇑F). T cell survival can be regulated by several mechanisms including Fas-Fas ligand (FasL) interaction, expression of pro- and antiapoptotic members of the bcl-2 family, and in the case of Th2 cells by expression of granzyme B (20, 21). However, we found no correlation between the observed phenotype and expression of T cell-associated bcl-2 family members, Fas, FasL, or granzyme B (data not shown). In conclusion, we propose the existence of a yet to be identified Stat6-dependent proapoptotic mechanism that limits the expansion of effector T cells under Th2-polarizing conditions. Although the role of Stat6 for Th2 cell differentiation during the acute phase of an immune response is well established, there is a lack of information regarding the role of Stat6 in regulation of memory T cell survival in vivo. Using the TCR-tg adoptive transfer system, we could determine whether Stat6 was required for memory T cell survival or not. TCR-tg cells from DO11.10/4get/Thy1.1 and DO11.10/4get/Stat6−/−/Thy1.2 mice were transferred to 4get mice, which were infected with N. brasiliensis plus OVA and challenged with intranasal OVA on day 3 after infection. Ten weeks later, splenocytes and peripheral lymph node cells were pooled, enriched for CD4 T cells, and analyzed by flow cytometry. As shown in Fig. 7⇓A, TCR-tg cells derived from WT (Thy1.1+) and Stat6-deficient (Thy1.1−) donors were observed, excluding a survival advantage of WT T cells. The memory T cells had lost IL-4/eGFP expression and acquired CD62L expression, indicating their central memory phenotype (Fig. 7⇓A). To analyze whether Stat6-deficient memory T cells are functionally impaired, the enriched CD4 T cells were cotransferred to naive secondary WT recipient mice followed by infection with N. brasiliensis plus OVA and intranasal OVA challenge. Similar to naive T cells, Stat6-deficient memory T cells expanded better compared with WT T cells (Fig. 7⇓B). Furthermore, the frequency of IL-4/eGFP+ cells in lung and lymph nodes among Stat6-deficient donor cells increased from 10% during primary stimulation to 40% during rechallenge (Fig. 7⇓C). Similarly, the frequency of IL-4/eGFP+ cells among WT donor cells increased from 20 to 60%. This clearly demonstrates that Stat6-deficient memory T cells can survive for several weeks in vivo and respond with a far more efficient Th2 polarization during the recall response. Taken together, this demonstrates that the regulatory function of Stat6 is even more critical to control secondary responses to Ag. Survival and expansion of memory Th2 cells is not dependent on Stat6. A, Flow cytometric analysis of pooled and enriched memory CD4 T cells performed on day 70 after adoptive transfer of TCR-tg cells from DO11.10/4get/Thy1.1 or DO11.10/4get/Stat6−/−/Thy1.2 mice into 4get/Thy1.1 recipient mice and infection with N. brasiliensis plus OVA. Dot plots are gated on CD4 T cells and show the frequency of TCR-tg cells (KJ1-26+) from WT (Thy1.1+) and Stat6-deficient (Thy1.1−) donors, the frequency of CD62L+ (central memory) and CD62L− (effector memory) TCR-tg cells, and the expression of IL-4/eGFP among TCR-tg (KJ1-26+) and endogenous (KJ1-26−) CD4 T cells. B, Analysis of the frequency of TCR-tg cells from WT and Stat6-deficient (S6) TCR-tg memory CD4 T cells among total CD4 T cells in lung and paratracheal lymph nodes after transfer and N. brasiliensis plus OVA infection in secondary naive recipient mice. Bar graphs show the mean ± SEM of combined results from two independent experiments with five mice total. The p values were calculated by Student’s t test. C, Comparison of the frequency of Th2 cells (IL-4/eGFP+) from cotransferred WT and Stat6-deficient TCR-tg cells in lung and paratracheal lymph nodes during the primary immune response (▦) or after transfer and challenge of memory TCR-tg cells in new recipients (▪). Bars show the mean ± SEM of combined results from two independent experiments with a total of four to seven mice per group. The differences between primary and secondary responses were highly significant (p < 0.001). Stat6-deficient mice and T cell transfer experiments allowed us to dissect the role of IL-4R-mediated signals in T cells and non-T cells for T cell expansion and recruitment during type 2 immunity. Competitive adoptive transfers of polyclonal or TCR-tg cells demonstrated that Stat6 was not required in non-T cells to mediate efficient Th2 cell recruitment to the lung. This observation was surprising, since it has been shown that in vitro-generated Th2 cells were not recruited to the lung after transfer into Stat6-deficient recipient mice which were treated to develop allergic airway inflammation (13). The apparent difference between our results and Mathew et al. (13) could be explained by the more physiological situation when Th2 cells differentiate in vivo. Perhaps factors and environmental conditions that are only present in vivo are required to enable Stat6-independent migration to the lung. Stat6 is known to regulate expression of the chemokine receptors CCR4 and CCR8 in Th2 cells and the chemokines CCL11, CCL24, as well as the CCR4 ligands CCL17 and CCL22 in tissues (7, 8, 22). However, Th2 cells from CCR4- and CCR8-deficient mice showed a normal response during OVA-induced allergic airway inflammation (23, 24), questioning the in vivo relevance for expression of these Th2-associated chemokine receptors to mediate Th2 cell recruitment to the lung. Our results support these findings as we demonstrate that although the frequency of IL-4/eGFP+ cells within the Stat6-deficient T cell populations was very low after infection, reflecting the requirement of Stat6 signaling for the stabilization of the Th2 phenotype, the absolute numbers of these cells in the lung and draining lymph nodes matched those of Th2 cells derived from transferred WT T cell populations. Therefore, we conclude that Stat6 expression in T cells is not required for recruitment to the lung. However, T cell-derived Stat6-dependent factors might enhance the recruitment of other cell types including eosinophils that could be involved in modulation of T cell survival in tissues. We could demonstrate that Stat6-mediated signals serve to limit the expansion of Ag-specific CD4 effector T cells. CFSE experiments showed that this was not caused by a block in T cell proliferation, and measurement of annexin V+ cells in Ag-stimulated in vitro cultures indicated the effect may rather be due to induction of apoptosis in developing Th2 cells. The CFSE dilution peaks and the lack of expression of GFP in annexin V+ cells revealed that cell death already occurred within the first rounds of T cell proliferation and may be coupled to Th2 cell fate decisions. Although the mitogenic and antiapoptotic activity of IL-4 on naive CD4 T cells is well established (25), it has also been demonstrated that activation-induced cell death (AICD) of CD4 T cells is enhanced in the presence of IL-4 (26). Interestingly, the antiapoptotic activity of IL-4 has been shown to operate independently of T cell intrinsic Stat6 expression, whereas IL-4-induced proliferation required IRS-2 and Stat6 (27, 28). However, most of these studies were performed with in vitro T cell cultures using pan-T cell stimulation and do not necessarily reflect the in vivo situation. In fact it has been described that Stat6-mediated signals can limit the expansion of T cells in vivo under different conditions. Competitive reconstitution experiments of Rag-deficient mice with T cells from WT and Stat6-deficient donors demonstrated preferential expansion of Stat6-deficient CD4 T cells (29). Furthermore, constitutive activation of Stat6 in T cells reduced the numbers of peripheral T cells compared with nontransgenic littermates and the frequency of apoptotic cells among ex vivo-isolated T cells was 2-fold higher (30). In addition, transgenic overexpression of IL-4 in T cells leads to marked reduction of double-positive thymocytes (31, 32). These findings indicate that the IL-4/Stat6 signaling pathway can cause apoptosis in T cells and support our observations presented here. The nature by which Stat6-induced signals promote T cell death needs to be explored in more detail. One study reported that Stat6 was required to maintain high bcl-2 protein levels in Th2-polarized in vitro cultures (25). Similarly, retroviral transduction of the Stat6-dependent transcription factor growth factor independent 1 into T cells resulted in increased expression of bcl-2 and bcl-xL and enhanced survival under neutral culture conditions (33). We also observed higher bcl-xL mRNA levels and lower Fas expression in WT compared with Stat6-deficient T cells cultured together under Th2-polarizing conditions (data not shown). Yet these findings did not correlate with cellular expansion in vitro or in vivo. A recent report demonstrated that AICD in Th2 cells was caused by release of granzyme B from cytoplasmic granules (20). In our hands, blocking granzyme B did not result in increased numbers of Th2 cells (data not shown). Therefore, granzyme B is probably not involved in limiting the survival of developing Th2 cells. What might be the significance of IL-4/Stat6-mediated negative feedback regulation for Th2 cell expansion? Uncontrolled Th2 cell accumulation in tissues can be harmful for the organism since release of Th2 cell-associated cytokines is known to cause severe side effects on healthy tissues. Therefore, it makes sense to allow expansion of Th2 cells to generate sufficient numbers of effector T cells required for efficient type 2 immune responses and at the same time prevent uncontrolled accumulation of these cells. In this context, it is important to note that IL-2 is also known to play a dual role in regulation of T cell expansion, since it can mediate proliferation and increase survival of T cells by up-regulation of bcl-2 and in contrast enhance the sensitivity for AICD by up-regulation of FasL (34). Stat5, which mediates signaling through the IL-2Rβ chain, was required for IL-2-induced up-regulation of FasL and AICD but not for IL-2-mediated survival of T cells (35). Although we did not observe differences in the expression level of FasL between WT and Stat6-deficient T cells (data not shown), it remains possible that other apoptosis-inducing molecules are regulated by Stat6. We conclude that the accumulation of Stat6-deficient T cells might be explained by the lack of a T cell-intrinsic Stat6-dependent factor that regulates susceptibility to IL-4-induced apoptosis. Alternatively, activated Stat6 might be involved in down-regulation of survival factor(s) in developing Th2 cells. Further studies are required to distinguish between these possibilities. In vitro studies have demonstrated that the expansion of Th1 cells is restricted by negative feedback regulation via IFN-γ, indicating that similar mechanisms exist to control the number of Th1 cells (36). This observation could be confirmed more recently in vivo by infection of WT and IFN-γ-deficient mice with Mycobacterium tuberculosis, although the reduced expansion of activated WT CD4 T cells could at least partially be caused indirectly by IFN-γ-induced NO production from macrophages (37). Although a comparable increase in total Th2 cell numbers in the lung of WT and Stat6-deficient mice was observed on day 8 after N. brasiliensis infection, Stat6-deficient mice have been shown to recruit far fewer eosinophils to the lung and peritoneum (38). This clearly demonstrates that eosinophil recruitment to the lung does not correlate with the total number of Th2 cells present in this organ. As we and others have shown before, eosinophil recruitment can be controlled by alternatively activated macrophages, which require Stat6 for their differentiation (11, 38, 39). Therefore, selective inhibition of Stat6 function in macrophages might be beneficial to reduce tissue eosinophilia. In contrast, based on our observations, blocking Stat6 in CD4 T cells might result in increased expansion of Ag-specific effector T cells which could in turn enhance allergic inflammation of the lung. Chronic type 2 immune responses like allergic disorders are thought to be mediated at least in part by reactivation of memory Th2 cells. Although extensive studies have been performed to characterize memory CD8 T cells and Th1-polarized memory CD4 T cells (40), relatively little is currently known about the phenotype, survival, and function of memory Th2 cells. Recent publications indicated that long-term memory Th2 cells display a central memory phenotype (CD62LhighCD44high) and provide protection against helminth and protozoan parasites (41, 42). Memory Th2 cells have been shown to accumulate at the host:parasite interface during secondary infections with the helminth parasite Heligmosomoides polygyrus and might enhance parasite clearance by inducing the differentiation of alternatively activated macrophages (43, 44). Using the same infection model, it has been shown that memory Th2 cells survived for several weeks in the peritoneum (18). The rapid increase in serum IL-4 levels during secondary infections with H. polygyrus was dependent on Stat6 and CD4 T cells (15). It has therefore been proposed that Stat6 might be required for survival and function of memory Th2 cells. Using a defined TCR-tg system and adoptive transfer of memory Th2 cells, we could show for the first time that Stat6-deficient CD4 T cells survived in vivo for prolonged periods of time and responded with a more pronounced Th2 cell differentiation compared with the primary response. In addition, mirroring the effect of Stat6 in limiting cell expansion during a primary immune response, the Stat6-deficient cells also expanded better than WT memory Th2 cells after cotransfer and rechallenge. Therefore, Stat6 expression in CD4 T cells was not required for survival of memory Th2 cells but may be required to control the severity of a recall response. Taken together, we present several novel observations regarding the role of Stat6 in regulating T cell responses. Although Stat6 is not required for T cell recruitment to effector sites or for the generation of memory T cells, it plays a role in limiting effector T cell numbers both in primary and secondary immune responses. Based on these results, therapeutic strategies aimed at reducing allergic inflammation by blocking the Stat6 signaling pathway in T cells might reduce the relative frequency of Th2 cells, but actually result in increased numbers of effector T cells in target tissues causing adverse effects. However, a better understanding of Stat6-mediated apoptosis in T cells bears the hope that this pathway could be exploited to selectively inhibit Th2 cell expansion in vivo. We thank T. Brocker, R. Obst, A. Gruber, and G. Haecker for helpful discussion and A. Bol and W. Mertl for animal husbandry. ↵1 This work was supported by an Emmy Noether Research Grant from the Deutsche Forschungsgemeinschaft (Vo944/2-2). ↵3 Abbreviations used in this paper: eGFP, enhanced GFP; BAL, bronchoalveolar lavage; FasL, Fas ligand; AICD, activation-induced cell death. Mohrs, M., K. Shinkai, K. Mohrs, R. M. Locksley. 2001. Analysis of type 2 immunity in vivo with a bicistronic IL-4 reporter. Immunity 15: 303-311. Takeda, K., T. Tanaka, W. Shi, M. Matsumoto, M. Minami, S. Kashiwamura, K. Nakanishi, N. Yoshida, T. Kishimoto, S. Akira. 1996. Essential role of Stat6 in IL-4 signalling. Nature 380: 627-630. Shimoda, K., J. van Deursen, M. Y. Sangster, S. R. Sarawar, R. T. Carson, R. A. Tripp, C. Chu, F. W. Quelle, T. Nosaka, D. A. Vignali, et al 1996. Lack of IL-4-induced Th2 response and IgE class switching in mice with disrupted Stat6 gene. Nature 380: 630-633. Noben-Trauth, N., L. D. Shultz, F. Brombacher, J. F. Urban, Jr, H. Gu, W. E. Paul. 1997. 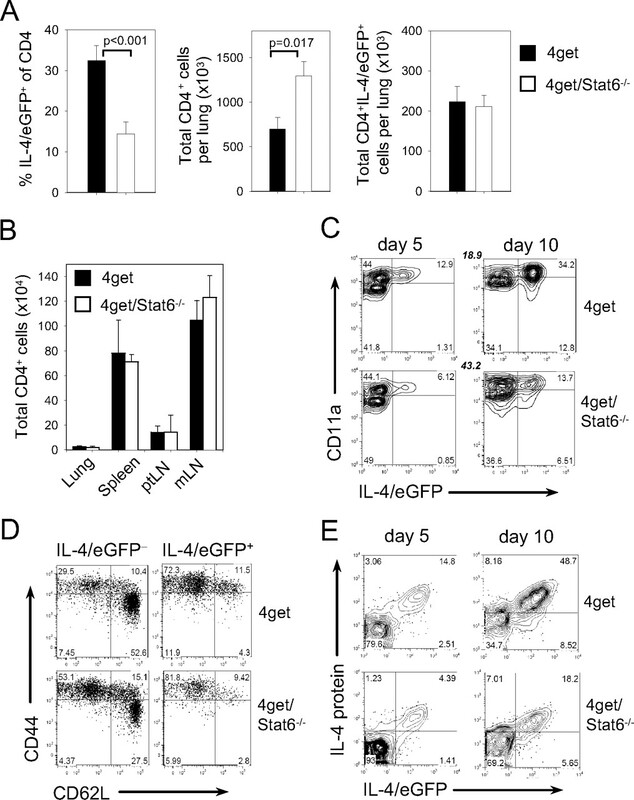 An interleukin 4 (IL-4)-independent pathway for CD4+ T cell IL-4 production is revealed in IL-4 receptor-deficient mice. Proc. Natl. Acad. Sci. USA 94: 10838-10843. Nelms, K., A. D. Keegan, J. Zamorano, J. J. Ryan, W. E. Paul. 1999. The IL-4 receptor: signaling mechanisms and biologic functions. Annu. Rev. Immunol. 17: 701-738. Kaplan, M. H., U. Schindler, S. T. Smiley, M. J. Grusby. 1996. Stat6 is required for mediating responses to IL-4 and for development of Th2 cells. Immunity 4: 313-319. Zhang, S., N. W. Lukacs, V. A. Lawless, S. L. Kunkel, M. H. Kaplan. 2000. Cutting edge: differential expression of chemokines in Th1 and Th2 cells is dependent on Stat6 but not Stat4. J. Immunol. 165: 10-14. Fulkerson, P. C., N. Zimmermann, L. M. Hassman, F. D. Finkelman, M. E. Rothenberg. 2004. Pulmonary chemokine expression is coordinately regulated by STAT1, STAT6, and IFN-γ. J. Immunol. 173: 7565-7574. Zimmermann, N., S. P. Hogan, A. Mishra, E. B. Brandt, T. R. Bodette, S. M. Pope, F. D. Finkelman, M. E. Rothenberg. 2000. Murine eotaxin-2: a constitutive eosinophil chemokine induced by allergen challenge and IL-4 overexpression. J. Immunol. 165: 5839-5846. Kuperman, D., B. Schofield, M. Wills-Karp, M. J. Grusby. 1998. Signal transducer and activator of transcription factor 6 (Stat6)-deficient mice are protected from antigen-induced airway hyperresponsiveness and mucus production. J. Exp. Med. 187: 939-948. Urban, J. F., Jr, N. Noben-Trauth, D. D. Donaldson, K. B. Madden, S. C. Morris, M. Collins, F. D. Finkelman. 1998. IL-13, IL-4Rα, and Stat6 are required for the expulsion of the gastrointestinal nematode parasite Nippostrongylus brasiliensis. Immunity 8: 255-264. Mathew, A., J. A. MacLean, E. DeHaan, A. M. Tager, F. H. Green, A. D. Luster. 2001. Signal transducer and activator of transcription 6 controls chemokine production and T helper cell type 2 cell trafficking in allergic pulmonary inflammation. J. Exp. Med. 193: 1087-1096. Jankovic, D., M. C. Kullberg, N. Noben-Trauth, P. Caspar, W. E. Paul, A. Sher. 2000. Single cell analysis reveals that IL-4 receptor/Stat6 signaling is not required for the in vivo or in vitro development of CD4+ lymphocytes with a Th2 cytokine profile. J. Immunol. 164: 3047-3055. Finkelman, F. D., S. C. Morris, T. Orekhova, M. Mori, D. Donaldson, S. L. Reiner, N. L. Reilly, L. Schopf, J. F. Urban, Jr. 2000. Stat6 regulation of in vivo IL-4 responses. J. Immunol. 164: 2303-2310. Liu, Z., Q. Liu, H. Hamed, R. M. Anthony, A. Foster, F. D. Finkelman, J. F. Urban, Jr, W. C. Gause. 2005. IL-2 and autocrine IL-4 drive the in vivo development of antigen-specific Th2 T cells elicited by nematode parasites. J. Immunol. 174: 2242-2249. Voehringer, D., T. A. Reese, X. Huang, K. Shinkai, R. M. Locksley. 2006. Type 2 immunity is controlled by IL-4/IL-13 expression in hematopoietic non-eosinophil cells of the innate immune system. J. Exp. Med. 203: 1435-1446. Murphy, K. M., A. B. Heimberger, D. Y. Loh. 1990. Induction by antigen of intrathymic apoptosis of CD4+CD8+TCRlow thymocytes in vivo. Science 250: 1720-1723. Voehringer, D., K. Shinkai, R. M. Locksley. 2004. Type 2 immunity reflects orchestrated recruitment of cells committed to IL-4 production. Immunity 20: 267-277. Devadas, S., J. Das, C. Liu, L. Zhang, A. I. Roberts, Z. Pan, P. A. Moore, G. Das, Y. Shi. 2006. Granzyme B is critical for T cell receptor-induced cell death of type 2 helper T cells. Immunity 25: 237-247. Wirnsberger, G., D. Hebenstreit, G. Posselt, J. Horejs-Hoeck, A. Duschl. 2006. IL-4 induces expression of TARC/CCL17 via two STAT6 binding sites. Eur. J. Immunol. 36: 1882-1891. Chvatchko, Y., A. J. Hoogewerf, A. Meyer, S. Alouani, P. Juillard, R. Buser, F. Conquet, A. E. Proudfoot, T. N. Wells, C. A. Power. 2000. A key role for CC chemokine receptor 4 in lipopolysaccharide-induced endotoxic shock. J. Exp. Med. 191: 1755-1764. Chung, C. D., F. Kuo, J. Kumer, A. S. Motani, C. E. Lawrence, W. R. Henderson, Jr, C. Venkataraman. 2003. CCR8 is not essential for the development of inflammation in a mouse model of allergic airway disease. J. Immunol. 170: 581-587. Vella, A., T. K. Teague, J. Ihle, J. Kappler, P. Marrack. 1997. Interleukin 4 (IL-4) or IL-7 prevents the death of resting T cells: stat6 is probably not required for the effect of IL-4. J. Exp. Med. 186: 325-330. Zhang, J., T. Bardos, Q. Shao, J. Tschopp, K. Mikecz, T. T. Glant, A. Finnegan. 2003. IL-4 potentiates activated T cell apoptosis via an IL-2-dependent mechanism. J. Immunol. 170: 3495-3503. Wurster, A. L., D. J. Withers, T. Uchida, M. F. White, M. J. Grusby. 2002. Stat6 and IRS-2 cooperate in interleukin 4 (IL-4)-induced proliferation and differentiation but are dispensable for IL-4-dependent rescue from apoptosis. Mol. Cell. Biol. 22: 117-126. Kaplan, M. H., C. Daniel, U. Schindler, M. J. Grusby. 1998. Stat proteins control lymphocyte proliferation by regulating p27Kip1 expression. Mol. Cell. Biol. 18: 1996-2003. Sanchez-Guajardo, V., J. A. Borghans, M. E. Marquez, S. Garcia, A. A. Freitas. 2005. Different competitive capacities of Stat4- and Stat6-deficient CD4+ T cells during lymphophenia-driven proliferation. J. Immunol. 174: 1178-1187. Bruns, H. A., U. Schindler, M. H. Kaplan. 2003. Expression of a constitutively active Stat6 in vivo alters lymphocyte homeostasis with distinct effects in T and B cells. J. Immunol. 170: 3478-3487. Tepper, R. I., D. A. Levinson, B. Z. Stanger, J. Campos-Torres, A. K. Abbas, P. Leder. 1990. IL-4 induces allergic-like inflammatory disease and alters T cell development in transgenic mice. Cell 62: 457-467. Lewis, D. B., C. C. Yu, K. A. Forbush, J. Carpenter, T. A. Sato, A. Grossman, D. H. Liggitt, R. M. Perlmutter. 1991. Interleukin 4 expressed in situ selectively alters thymocyte development. J. Exp. Med. 173: 89-100. Zhu, J., L. Guo, B. Min, C. J. Watson, J. Hu-Li, H. A. Young, P. N. Tsichlis, W. E. Paul. 2002. Growth factor independent-1 induced by IL-4 regulates Th2 cell proliferation. Immunity 16: 733-744. Waldmann, T. A., S. Dubois, Y. Tagaya. 2001. Contrasting roles of IL-2 and IL-15 in the life and death of lymphocytes: implications for immunotherapy. Immunity 14: 105-110. Van Parijs, L., Y. Refaeli, J. D. Lord, B. H. Nelson, A. K. Abbas, D. Baltimore. 1999. Uncoupling IL-2 signals that regulate T cell proliferation, survival, and Fas-mediated activation-induced cell death. Immunity 11: 281-288. Liu, Y., C. A. Janeway, Jr. 1990. Interferon γ plays a critical role in induced cell death of effector T cell: a possible third mechanism of self-tolerance. J. Exp. Med. 172: 1735-1739. Voehringer, D., N. van Rooijen, R. M. Locksley. 2007. Eosinophils develop in distinct stages and are recruited to peripheral sites by alternatively activated macrophages. J. Leukocyte Biol. 81: 1434-1444. Falcone, F. H., P. Loke, X. Zang, A. S. MacDonald, R. M. Maizels, J. E. Allen. 2001. A Brugia malayi homolog of macrophage migration inhibitory factor reveals an important link between macrophages and eosinophil recruitment during nematode infection. J. Immunol. 167: 5348-5354. Zaph, C., J. Uzonna, S. M. Beverley, P. Scott. 2004. Central memory T cells mediate long-term immunity to Leishmania major in the absence of persistent parasites. Nat. Med. 10: 1104-1110. Zaph, C., K. A. Rook, M. Goldschmidt, M. Mohrs, P. Scott, D. Artis. 2006. Persistence and function of central and effector memory CD4+ T cells following infection with a gastrointestinal helminth. J. Immunol. 177: 511-518. Morimoto, M., J. Whitmire, S. Xiao, R. M. Anthony, H. Mirakami, R. A. Star, J. F. Urban, Jr, W. C. Gause. 2004. Peripheral CD4 T cells rapidly accumulate at the host: parasite interface during an inflammatory Th2 memory response. J. Immunol. 172: 2424-2430. Anthony, R. M., J. F. Urban, Jr, F. Alem, H. A. Hamed, C. T. Rozo, J. L. Boucher, N. Van Rooijen, W. C. Gause. 2006. Memory TH2 cells induce alternatively activated macrophages to mediate protection against nematode parasites. Nat. Med. 12: 955-960. Mohrs, K., D. P. Harris, F. E. Lund, M. Mohrs. 2005. Systemic dissemination and persistence of Th2 and type 2 cells in response to infection with a strictly enteric nematode parasite. J. Immunol. 175: 5306-5313.